Ten Lego kits transformed into autonomous robotic vehicles will gather, with their high school student masters, on Saturday, May 21 at the Smithsonian for the 2011 national championship of the Institute of Navigation Mini-Urban Challenge. It all happens from 8 a.m. to 5 p.m. in the Spark!Lab and first floor of the Lemelson Center for the Study of Invention and Innovation on the National Mall. This year, the challenge attracted 500 students from 50 high schools. Ten teams made it through five regional competitions in California, Florida, Louisiana, Ohio and Washington DC. They will compete for cash awards for first, second and third place in the final round. The high schools that took the top three prizes in 2010 return to the finals this year. They are Florida’s Pace High School, with the first and third place teams, and second place winner Parkway High School from Bossier City, Louisiana. All of the other eight contenders are competing for the first time. In Washington, the teams will get their first look at a map of the 420 square foot LEGO city 45 minutes before their vehicle enters it. They’ll have 45 minutes to navigate the course, and it won’t be easy — the robot will face mandatory stops in assigned parking spaces, curved roads, intersections, and a strict speed limit. After that, the robots get to rest, but the students have to present a cogent 30 minute report that counts for 30 percent of the score. The Lemelson Center is part of the Smithsonian’s National Museum of American History, located on the National Mall at 14th Street and Constitution Avenue in Washington, D.C. In addition to the competition, each student team will spend time in Spark!Lab working with visitors on simple robotics projects. 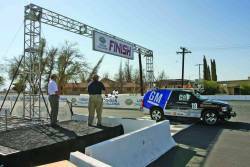 This is the third year for Mini-Urban Challenge. It is co-sponsored by the Institute of Navigation and the Air Force Research Laboratory Munitions Directorate (AFRL) as part of their effort to interest more young people in science, technology and math —especially satellite navigation engineering and technology.